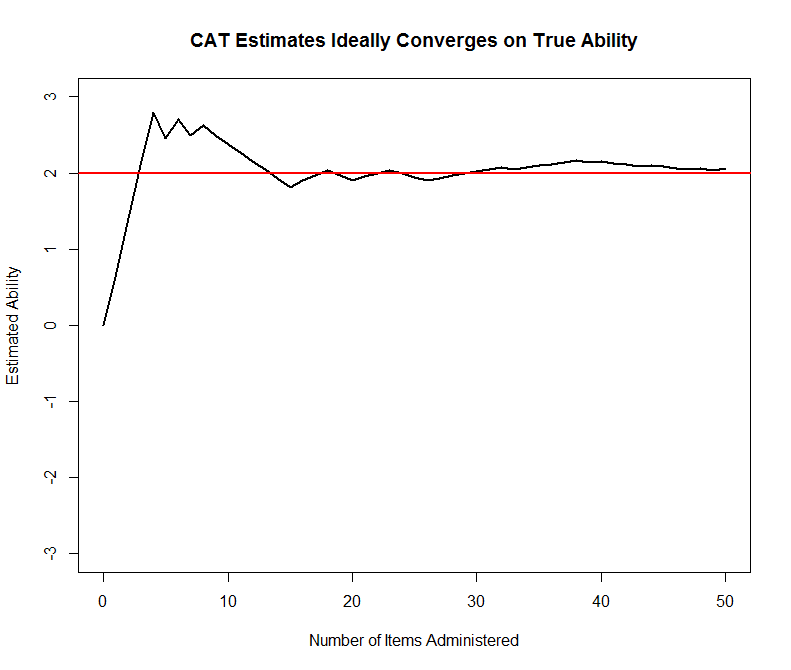 # In order for us to understand what a Computer Adaptive Test (CAT) is, let's first think about how the CAT works. 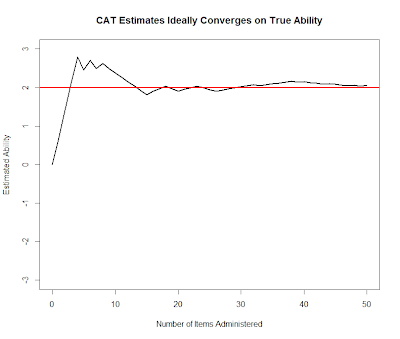 # A CAT test starts by having some kind of initial assessment of student ability (test taker's ability). # This is typically at the population mean. 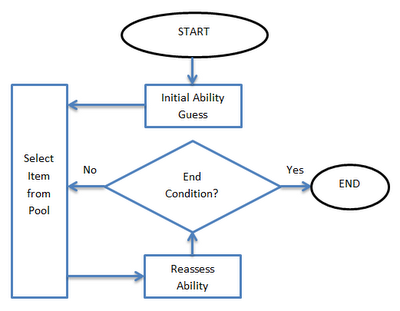 # The test then selects an item that (in the most straightforward case) has the most information at that initial guess. # If the student answers that question correctly then the program reassesses student ability and finds the next question which has the most information at the new assessment of student ability. # How much do we adjust our estimate of person ability when all answer's are either right or wrong. # Number of items on the test. This will be the end condition. # Let's generate a vector to hold ability estimates. # Let's first generate a empty data frame to hold the set of item taken. # For this first mock test we will not select items from a pool but instead assume the pool is infinite and has an item with an a=a.base, c=c.base, and b equal to whatever the current guess is. # Let's select our first item - a,b,c, response are scalars that will be reused to simplify coding. 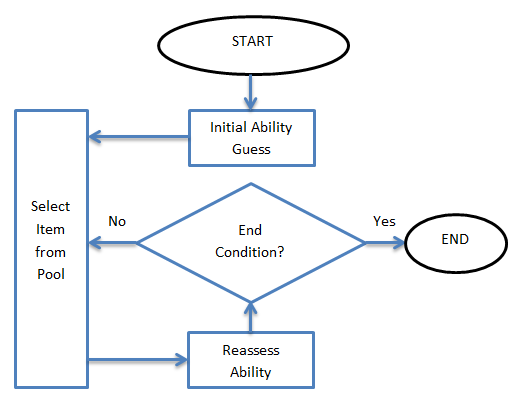 # The Item Characteristic Curve (ICC) gives the probability of getting the item correct. # We have now successfully administered our first item. # Should do our first MLE estimation? # Not quite, unfortunately MLE requires in the bianary case that the student has answered at least one question right and at least one question wrong. # This condition will no longer be true when at least one of the items is ansered correctly and one of the items answered incorrectly. # Okay, it seems to be working properly now we will loop through using the above function. # The only thing we need change is the ability estimate. # We can see that even in this ideal scenario in which you always have appropriately difficult items with high discriminatory power and low guessing, there is a noticeable amount of error.